Water shoes are essential for working out in the water. Water aerobics is one of the top ways to get some exercise, especially if you have health problems that keep you from exercising in the more traditional methods. While most people who perform water aerobics think all they need is a comfortable swimsuit to wear, this is not correct. You also need a great pair of Speedo water shoes to wear while you exercise. This will provide you with the support you require and help you perform even better so you can maximize your workout. If you thought you could perform water aerobics without wearing shoes, you need to reconsider. Think about it. Even though the water cushions many of your joints, your feet will still hit the hard bottom of the pool. When you wear the right pair of water shoes, you will gain the same type of support you would get from your typical tennis shoes without the bulk. This will allow you to perform even better in the water so you don’t have to worry about sore feet at the end of the workout. You also need traction when you are working out so you don’t have to be concerned with falling. This is especially essential for those who already suffer from balance issues. 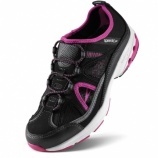 Speedo water shoes provide you with many incredible features that make them easy to wear while you are working out. For instance, the shoes have textured bottoms so you can obtain the traction you require against the bottom of the pool. The Speedo Hydro Comfort water shoes also help disperse the water and proper ventilation when you are out of the water. These shoes also dry quickly so you don’t have to walk around in wet shoes. The Hydro Comfort shoes are available in black and pink or gray and blue so you can choose the ones that go best with your swimsuit. Working out in the water is a great way to get the exercise you need without putting a lot of additional stress on your body. However, you shouldn’t attempt it without first buying a good pair of water shoes. When you wear the right water shoes, you will experience all the benefits you need so you can maximize your workout and achieve the results you are seeking. The right water aerobics shoes are essential to success. One of the most popular ways for people to get in shape without putting a lot of stress on their bodies is by participating in water aerobics. If you are interested in this fun way to get in shape and stay that way, it is important to find the right water aerobics shoes to wear in the water. While some people choose to complete these aerobics in bare feet, it is more beneficial to wear the right kind of shoes, just like with any other type of exercise. Flexibility is extremely important when it comes to water aerobic shoes. However, the sole should not be flimsy. When you are working out in the water, your feet require the proper support to ensure you don’t end up hurting yourself in the water. As you shop for the right shoes for your water aerobics class, look for soles that are thicker but still offer you the level of flexibility that makes it easy to wear them in the water. This will provide you with the right combination of support and freedom for the best results. Some people think they can purchase any type of water shoes and use those for their water aerobics class. However, this isn’t the best option for most people. You need to make sure these shoes fit you well so you don’t risk stumbling and falling or suffering from the effects of shoes that are too tight. 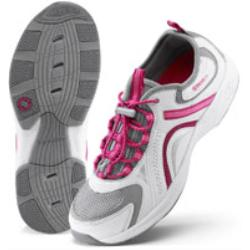 The right water aerobics shoes will be adjustable, often with elastic laces, so you can create the perfect fit for your feet so you can enjoy all the benefits of a water aerobics class. The bottom of a swimming pool can be slippery. While some have a textured bottom to provide some additional traction, others have a simple tile bottom. No matter what type of bottom the pool has, you should make sure the water shoes you purchase offer good traction. A textured bottom to the shoes will prevent you from slipping while you are performing the exercises so you can be safe. Water aerobics can be a great way to stay in shape, especially if you suffer from joint problems or other problems that make regular exercise more difficult. If this is your chosen method of exercising, it is critical to find the right water aerobics shoes to meet your needs and help you make the most of your time in the water. Water shoes are special shoes designed specifically to wear in the pool, lakes or rivers. They provide the perfect amount of traction and allow you to walk without slipping or scraping your feet. Swim shoes have various uses that prove to be beneficial to those who spend time in any type of water. 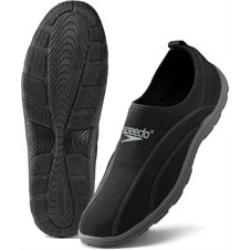 One of the most popular uses for special aqua shoes are for water aerobics classes in the pool. During these classes, participants are jumping and moving around quickly, making it easy to slip or scrape your feet on the bottom of the pool. When you protect your feet with protective shoes that can be worn in the water, this will not occur, allowing you to maximize the results of your aerobics class, rather than taking it easy to protect yourself from getting injured. If you spend time at the beach, it is beneficial to wear special water shoes to protect your feet from the harsh bottom of the lake or ocean. You never know what the ground of the body of water consists of when you explore the water. You could put your feet at great risk for scrapes and other injuries without proper footwear. Water shoes help protect your feet in and out of the water. The Speedo Surfwalker Pro is the perfect pair of aqua shoes. 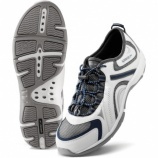 They offer a modern look to classic water shoes and are available for men and women. The mesh top and jersey material of these shoes dry quickly, allowing you to experience comfort, even when you are not in the water. These swimming shoes are also easy to slip on when dry and take off when wet, still allowing you to have a comfortable fit in and out of the water. When you are not in the water but will be near it, whether at the pool or beach, it is also good to have water sandals that can handle getting wet while you are on the sidelines. There are various styles for men and women that offer incredible comfort, style and performance that lasts no matter how wet they get. For women, one of the more popular styles is the Dolfin Uglies Flop Flops; with their flexible sole for traction and incredible style, they are the perfect pool side shoes. For men, one of the more popular styles is the Speedo Poolside Men’s Pool Slide, which provides incredible traction, a comfortable sole for long-term wear and an adjustable Velcro strap for a secure fit. Whether you are going to beach or pool at your leisure or you are going to be working out in a pool setting, there are various types of watershoes for the beach you should consider. Even though some local stores may carry watershoes, you will feel much better if you purchase watershoes from a bigger swimming brand, such as Speedo. Understanding the various types of watershoes will help you pick the pair that is the best for your situation. If you are looking for men’s watershoes to wear to the beach, the Surfwalker Pro is an all-purpose beach watershoe that will work well for your beach excursions and trips to the pool. Available in black, lime, navy blue and electric blue, these shoes will give you a great fit without being difficult to put on. The jersey and mesh material will dry quickly so you don’t need to walk around in wet shoes all day. The women’s version of the Surfwalker Pro watershoes offers the same features as the male version, suited for the size and shape of a woman’s foot. Just like the men’s version, these shoes are a perfect addition to your beach bag or pool bag so you can walk around without worrying about stepping on something that can hurt your foot. Even if wear them in the water, they will dry quickly so you can wear a dry pair of shoes. The women’s version is available in your choice of aqua, berry, black, black and pink, and black and purple. Hydro Trainers look like regular shoes, but they are really watershoes. If you take part in water aerobics or some other type of water training, the women’s Hydro Trainer watershoes are a great option. Even though they look and feel like typical tennis shoes, they are meant to be worn in the water. Not only will they provide better grip on the bottom of the pool, they give your feet the support they need while you work out. These shoes are available in navy, pink and red so you can find a pair to match your suit. Watershoes can provide you with protection and support while you are spending time on the beach or at the pool, both in and out of the water. If you just want a pair you can wear for recreational use, the general purpose watershoes will fit the bill. However, if you plan to participate in water aerobics or another aquatic fitness routine, hydro trainers can be the perfect choice for you.